2011 | KITCHENOLOGY: The Study of All Things Kitchen! I found this recipe on http://www.Food.com and have made it twice now! Love love love it. It is now our go-to! Very moist, good flavor and healthy! Highly highly recommend making this to everyone. We made doubles (1/2 lb) and calculated them to be roughly 600 calories with our toppings and the bread. Realistically, I should have just eaten a single – but I was feeling pretty hungry because I had just come from spin class.. 🙂 Either way, not too shabby for a dinner meal! With the fries, it was probably about 800 total for the meal. Combine all ingredients and shape into patties. With all of the added ingredients, if you are using 1.5 lbs of turkey, it yields roughly 8 patties (4 oz each). I used my kitchen scale to measure them out 🙂 We also smooshed the burgers out to be as round as the buns we were using (~1/4 inch thick). I found that they didn’t really shrink up too much, which was great! Grill 5-6 minutes per side in a grill pan (I flip them when the meat is cooked a little more than halfway up the burger). Top with anything that you like! We normally pick some kind of fun cheese like jalapeno havarti out of the deli section or use sharp cheddar. 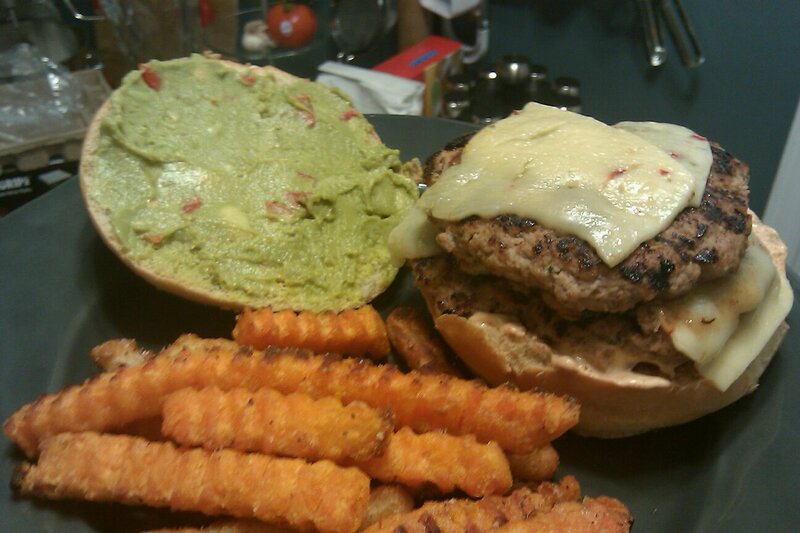 Wholly Guacamole is now making 100 calorie guac packs for snacking, but we use them for our burgers because we can split a package between our two burgers and don’t have to worry about the rest going bad! Happy Cooking!! If you come up with any fun topping combinations, feel free to share!